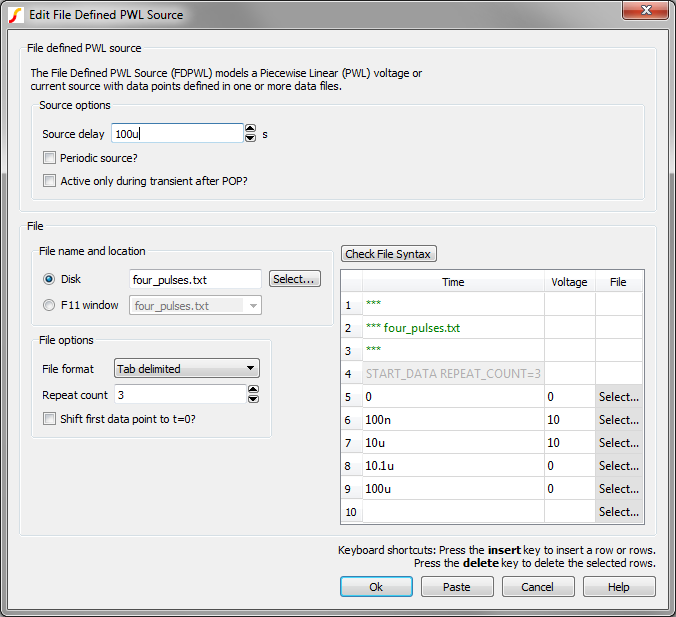 Opens the dialog box shown below allowing the entry of X-Y pairs intended for the definition of file defined piece-wise linear sources. 1 Checkbox state for Periodic source checkbox. 2 Checkbox state for Active only during transient after POP? checkbox. 4 File location used to initialize the radio selection. 'Disk' or 'F11'. 5 Reference designator for souce, used in error messages. 6 Pipe (|) delimited list of F11 filenames used to populate the F11 window combobox. 4 File location radio button state. 'Disk' or 'F11'. String arrays can be written to file with the Show command.